Ian Mulder was one of several artists with studios above Family Drugs overlooking what is now the Oil Lamp. His artwork is found many places downtown, including Edmonton’s (in)famous stripclub Chez Pierre. Mulder’s murals endure due to his use of polyester interfacing applied to the wall with a gel medium prior to painting. 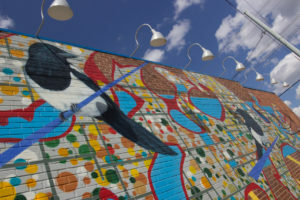 This mural honours the magpie, with which Edmonton has an uneasy relationship due to its scavenger nature. Mulder is now a practising architect in Toronto.